Ian Brown has been in touch. His father’s cousin Joe MacDonald worked for the Asiatic Petroleum Company pre WW2. Ian writes,” the Shanghai base [of APC] seems to ring a bell for me when I recall my father talking about Joe MacDonald’s time in China which I feel was not necessarily that long, curtailed by the war. I have a record of him sailing on the Corfu for Hong Kong in November 1937, he married Lizzie Smith in September 1937, he married late at the age of 43.” I’ll post what Ian knows about Mr MacDonald in a separate article. It seems highly likely that Joe and Jack will have known each other. Nicholas has a superb collection of photographs of APC buildings in about nine cities in China. They are linked below. Let’s start with some background information about the company. Asiatic Petroleum Company was a joint venture between the Shell and Royal Dutch oil companies and was founded in 1903. 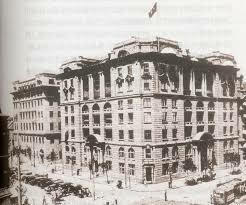 It operated in Asia in the early 20th century with its corporate headquarters on The Bund, in Shanghai. Before the formation of the Royal Dutch Shell Group in 1907, Shell Transport Trading Company Limited and Royal Dutch Petroleum Company, originally competitors, established a presence in the South China region. 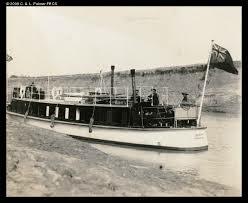 The Shell Company is recorded as exporting to China by 1891 and Royal Dutch by 1894. The benefits of working together to develop Far Eastern markets for oil products had already become apparent by the early part of the new century and a joint venture, the Asiatic Petroleum Company Limited (APC), was set up for this purpose in 1903. Before and after the merger of interests in 1907, much of the companies’ business was conducted through agents, but by 1913 demand for oil products had outgrown this arrangement and APC’s northern and southern branches were formed to manage operations in the region. APC (South China) set up its office in Hong Kong’s Central district as a regional head office for South China and the Philippines. These are the direct antecedents of the present Shell Companies in China and Hong Kong. In 1941, APC (South China) was the second largest corporation in Hong Kong, with an issued capital of over HK$150 million – just less than the Hong Kong and Shanghai Bank. However, business activities ceased during WWII when Japan requisitioned APC’s possessions in Shanghai and Hong Kong. Asiatic Petroleum Company building The Bund, Shanghai, 1920s? This article was first posted on 27th November 2014. Did ASP have offices in Peking? Is it possible to access a list of employees from 1907? Does Shell have an archivist? Hello, I am trying to track my grandfather Ernest Kirk who worked here before WW1 broke out. Like Yvonne above, I would like to know if there is an archivist at Shell who can help me find out more. Hello I am trying to find out further information on my late uncle Godfrey Thomerson who worked as an “assistant” at Asiatic Petroleum in the years leading up to WW 2. He served with the Royal Hong Kong Volunteer regiment and was killed on Dec 25th 1941.